Buried deep within the 339 page Congressional report on the "Commerce, Justice, Science, and Related Agencies Appropriations Act of 2010" that just came out of conference was a small number in a long table that will have a big impact. The language in the bill shows that NASA's Centennial Challenges program is in line for an appropriation of $4 million to use on new incentive prizes aligned with NASA's core missions. Although just a small drop in the roughly $18 billion bucket that is NASA's budget, this is an important signal that NASA and Congress believe in the growing community of space entrepreneurs and citizen inventors, and an important departure from recent history. The Centennial Challenges program was created in 2003--the 100 year anniversary of the Wright Brothers' first flight, hence the "Centennial" in the program's name. Inspired by the then-imminent conclusion of the $10 million Ansari X PRIZE for Suborbital Spaceflight, the program was designed to offer a series of incentive prizes that would spur innovation in a variety of fields and disciplines related to NASA's space exploration and aeronautics goals. The program was given just under $10 million of in fiscal year 2005. Using this money, the agency created seven different prizes--the Regolith Excavation, Green Flight, Lunar Lander, Power Beaming, Tether, Astronaut Glove, and Lunar Oxygen Production Challenges--each of which was designed to be won in approximately three years. 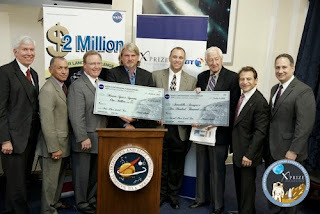 To further increase the cost efficiency for NASA, the agency partnered with non-profits who would then find corporate sponsors and assume the burden of financing the operations of the prize; for example, the X PRIZE Foundation was signed on to manage what became known as the Northrop Grumman Lunar Lander X PRIZE Challenge. In subsequent years, NASA and the White House requested additional funding for the program, in order to launch new prizes even as the existing prizes matured. In fiscal years 2006 through 2009, though, those funding requests were denied. Although the reasons such denial are never one hundred percent clear--one expects that the fact that prize money is not guaranteed to go to any particular congressional district may have played a role--the fact that prize money had not yet been spent certainly played a factor. Fortunately, while the process of getting additional funding for the program has been frustrating, the progress being achieved by the teams competing for has been impressive. Although one of the prizes--the Lunar Oxygen Production Challenge--expired unclaimed, the others six have each given away some or all of the money. A total of over $4.5 million has been given away in the other six challenges, including $3.65 million that was awarded in 2009. Again, $4.5 million may seem like nothing in an industry famous for multi-billion dollar missions and vehicles. But the results that small amount of money have achieved have been very impressive. At one level, there is the finances--to use the Northrop Grumman Lunar Lander X PRIZE Challenge as an example, the $2 million that was awarded in that prize liberated more than $20 million and more than 75,000 person hours from the dozen teams that registered to compete. But there's also the magnitude of the accomplishments themselves: to use the same prize an example, the contest has stimulated the production of multiple vehicles each quite similar in capacity to the government funded Delta Clipper, a rocket that cost roughly $90 million in present-day dollars to produce in the mid-nineties. The other prizes have produced similarly impressive results. And so, after five years of drawing down from that initial balance of nearly $10 million, it is almost certain the Centennial Challenge program will finally have new funds to play with. Congress still needs to pass the bill, and the president must sign it into law, but with the conference between the House and Senate versions of the bill complete, Congress now has only a binary yes/no decision. It would seem that they are prepared to reward the Centennial Challenges program and the community of teams that compete for these prizes with a new investment. The Centennial Challenges office--which knew it would have at least the money previously allocated to the now-expired Lunar Oxygen Production prize--has already solicited suggestions from the public on which prizes it should conduct next. Barring a major surprise, they'll have a significant chunk of money to play with, which will presumably go to fund two or three new prizes. And that's a good thing for NASA, for tax-payers, and for a rapidly growing community of space entrepreneurs.